Buying all valuable gems stones. Paying 100% of Market prices for Silver Eagles. ​*This does not include collector/numismatic coins or proofs which have other values. Paying 80% on all sterling silverware and unbroken jewelry! market price for damaged silver jewelry. Market prices are pure gold 24k or .999. Market prices are in troy ounces. One troy ounce (ozt) is equal to 31.1034768 grams or 20 pennyweights. We advertise daily what we pay per gram and pennyweight. 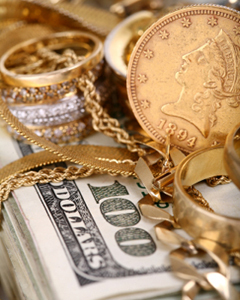 We are one of the only gold buyers that do NOT use a variable payout rate. ​We educate the public on how they can determine the value of their items. Get a real-time estimate of what we pay! ﻿Please note that our gold calculator is set on pennyweight. This calculator is 80% of the London gold market price. It is to be used for jewelry, dental, and other scrap gold items. Call for prices on bullion coins and bars. Please note this calculator is 80% of silver market price.